Centuries go by, Rome grows and the site of the Colosseum is improved. 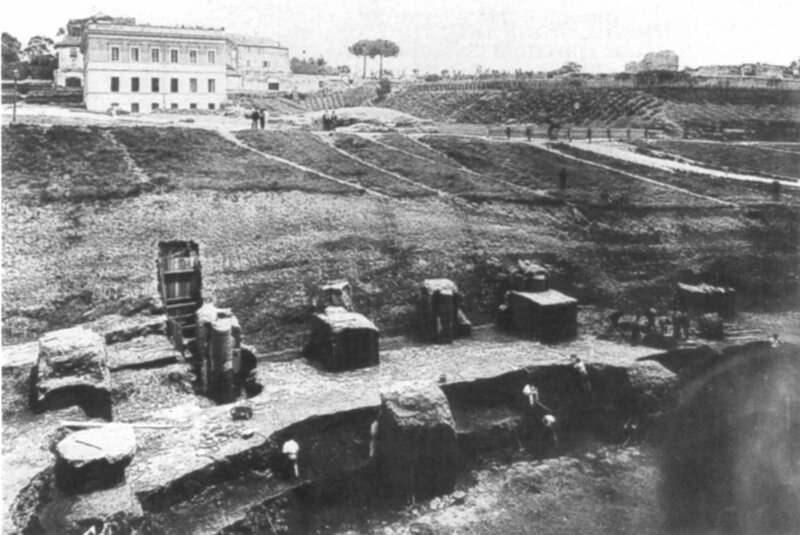 Drains are built and the lake, where the Colosseum now stands, disappears. 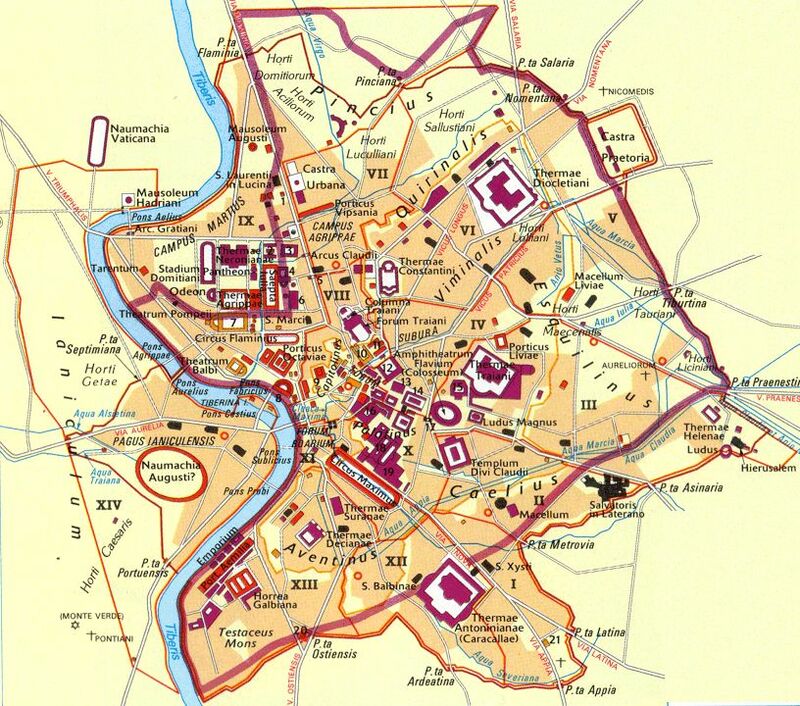 The place is full of houses and temples, since the site is the meeting point of four of Rome's regiones. After the famous fire in 64 b.C. 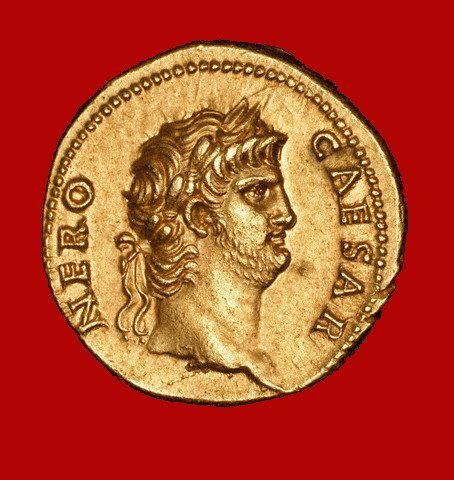 Nero occupies most of the centre of the city. 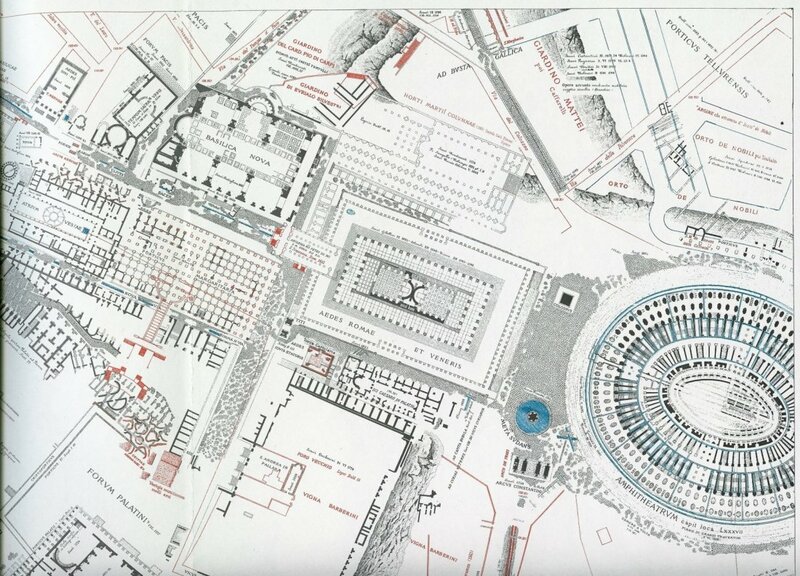 He clears the area and builds a magnificent residence, the Domus Aurea: with palaces, parks, pavilions and all sorts of wonders (size debated between 40 and 120 acres). See the whole story in this documentary with a 3D reconstruction of Nero's palace. 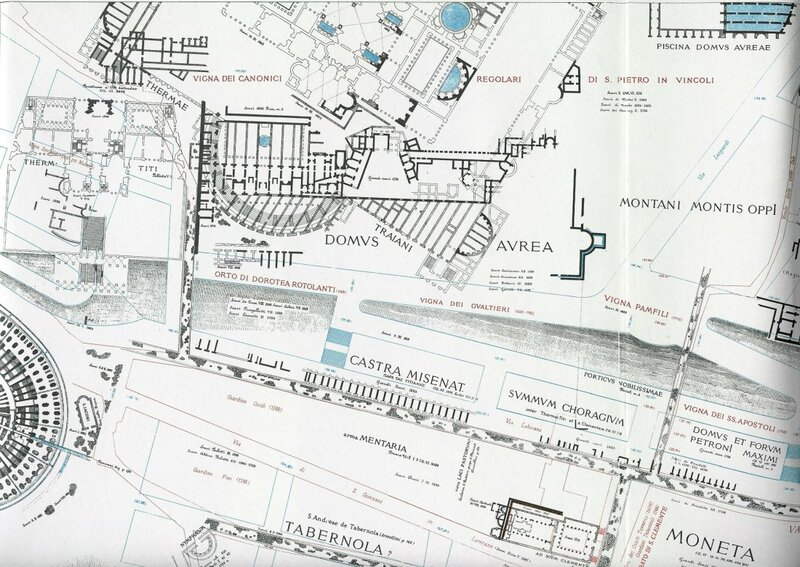 At the bottom of the valley Nero has a great rectangular pond built, surrounded by a portico. 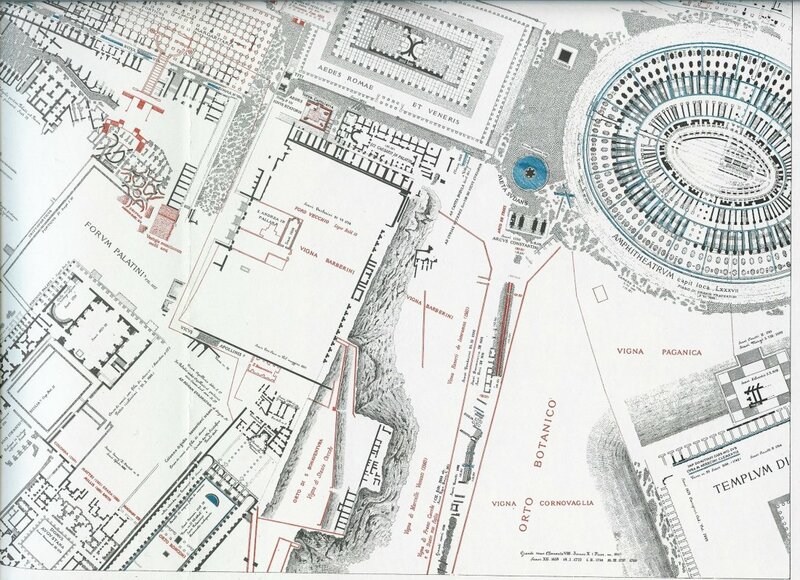 After Nero's death, the new emperor Vespasian gives back to the Romans much of Nero's Domus Aurea, and starts the construction of a public building - an amphitheatre - right in the spot where Nero's lake was. The place is now packed with monuments, palaces, statues, public buildings etc. These tables 1 2 3 4 5 are taken from the famous map by Rodolfo Lanciani in which the ancient and modern city are depicted in different colours. It was called Forma Urbis as a homage to the Roman original marble map, the Forma Urbis. 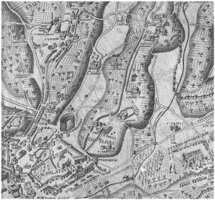 The last map below was printed at the end of the 18th century by Franz Anton Schraembl (1751-1803), who was a Vienna based cartographer. 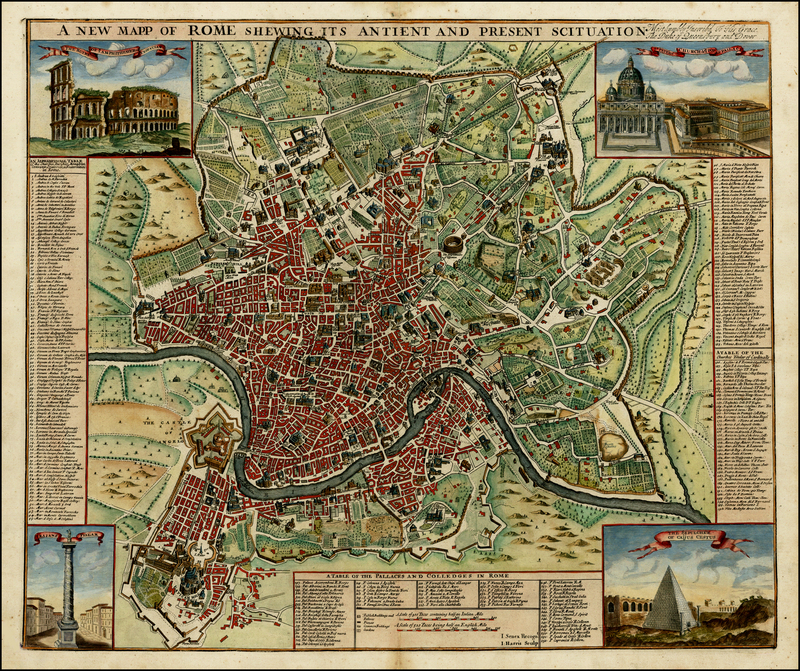 The map of ancient Rome probably is not accurate, but it is beautifully drawn and printed. 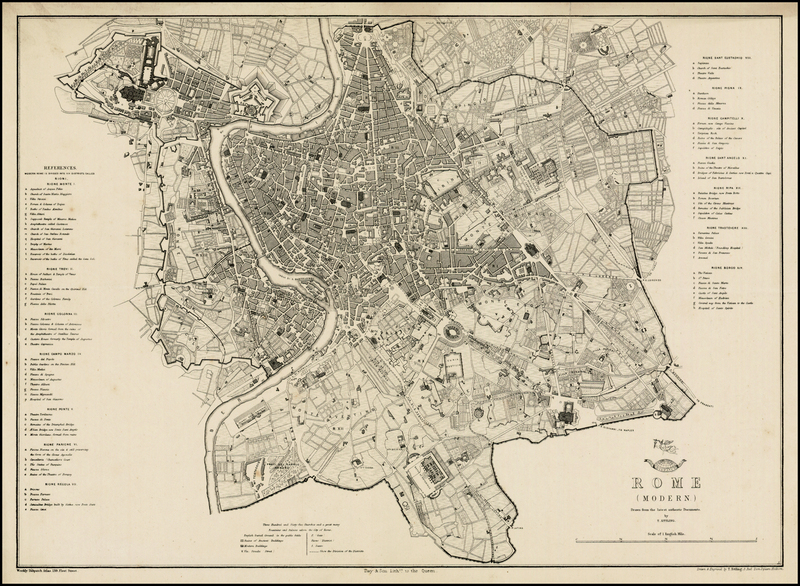 The Forma Urbis Romae was a large marble plan of Rome carved at the beginning of the III century in scale 1:240. The map measured ca. 18.10 x 13 meters or ca. 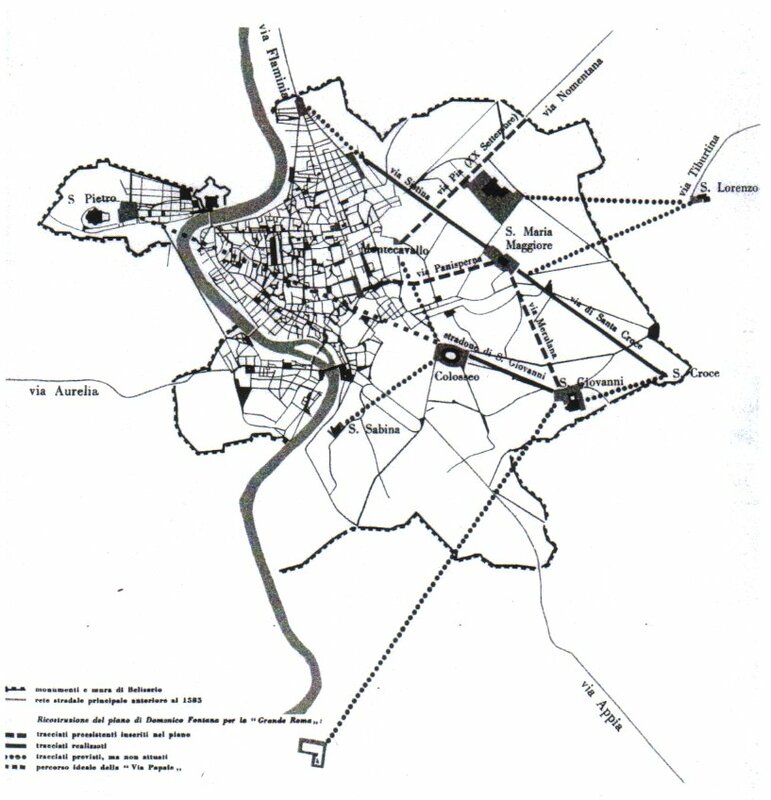 60 x 43 feet and depicted in detail the ground plan of all architectural features in the ancient city. It hung on a wall of the Templum Pacis in Rome. Today, we only have 1,186 pieces, or 10-15%, of the map. 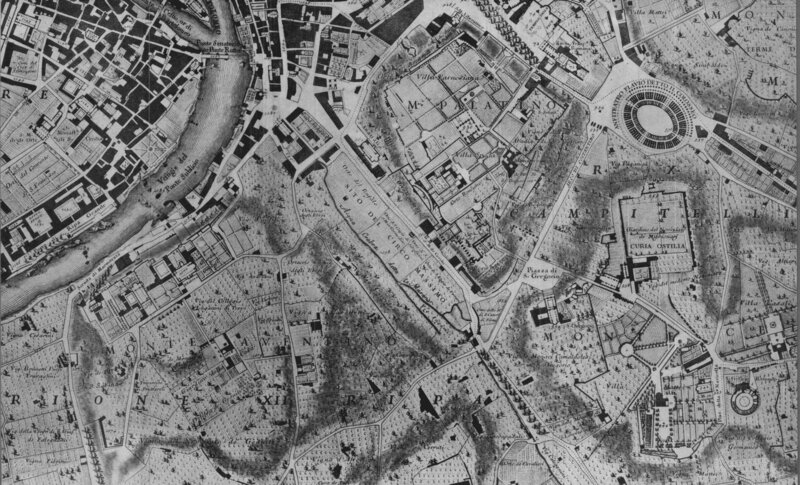 The Forma Urbis is also remarkable as it is extremely precise, and was drawn - obviously after a careful survey - by using modern criteria . Nothing of this kind will reappear until the 15th century! 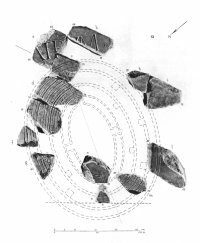 The image represents the few fragments left that show the Amphitheatre. 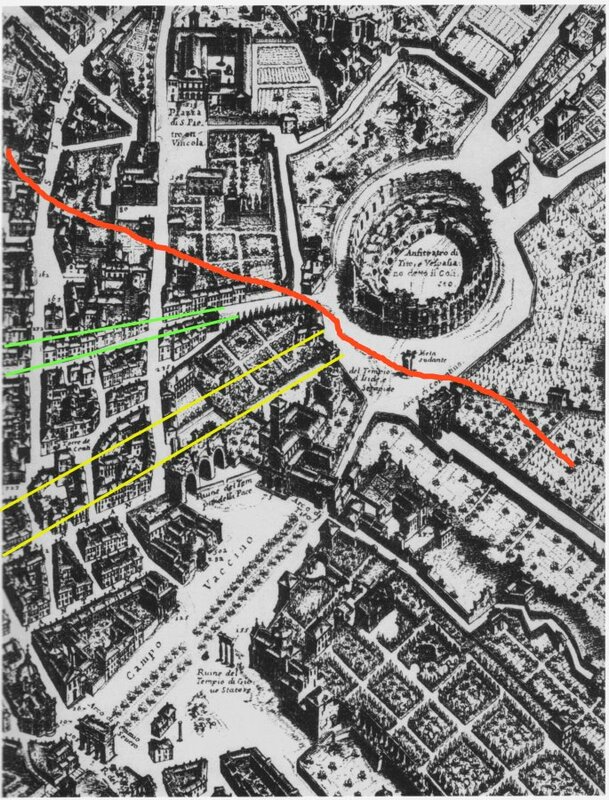 During the middle ages the arena became a crossroad, probably a marketplace: many streets met there. 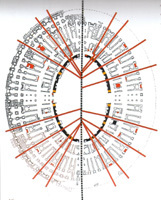 The map below shows the paths that had been made to cross the amphitheatre. 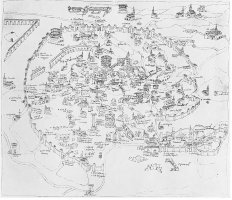 This print is a reconstruction of the state of the city around year 1000. 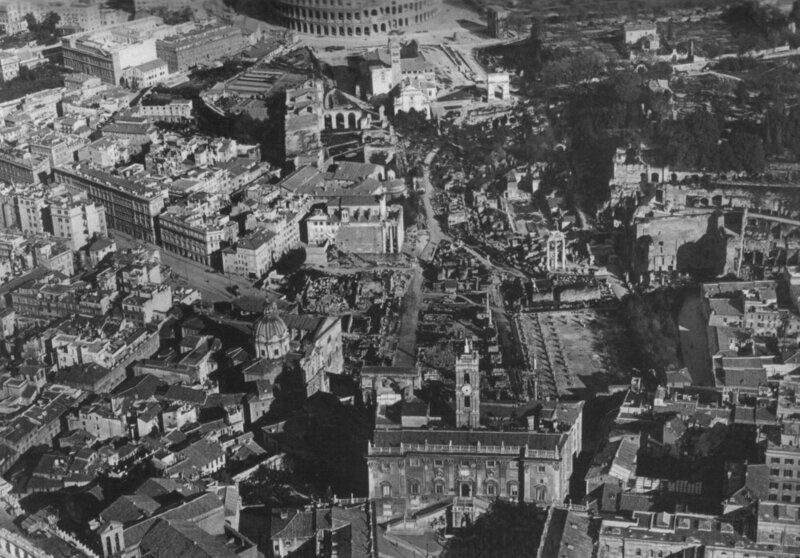 The view is from the East and shows how the Colosseum was practically still intact, as were many ancient temples and monuments (e.g. Hadrian's mausoleum). Within the walls of the city empty spaces are predominant. 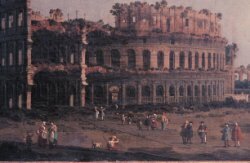 The neighbourhood was very lively in those days: the Colosseum was inhabited and the area was crossed by many streets. 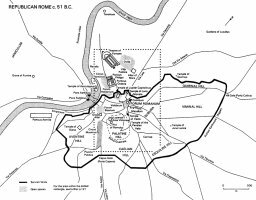 The building, whose function was by now forgotten, became a house and fortress, and it was on the main path between the centre of the city and the Lateran, where the Popes resided in those times. The beautiful miniature at the left comes from a famous illuminated manuscript, the Très Riches Heures du Duc de Berry. 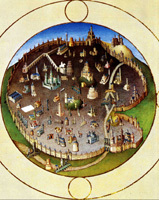 It is possibly the best example of French Gothic manuscript illumination surviving to present day. It was created for John, Duke of Berry, by the Limbourg brothers between 1412 and 1416. 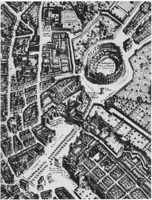 The view is from the North; the circular representation of the city is rather fantastic, but it is typical of that age and there are all the most important elements: aqueducts, walls, churches etc., and - of course - the amphitheatre. The image at the right is a fresco of Taddeo di Bartolo in the Siena Townhall, painted in exactly the same period (1412-1415). The similarities are striking! 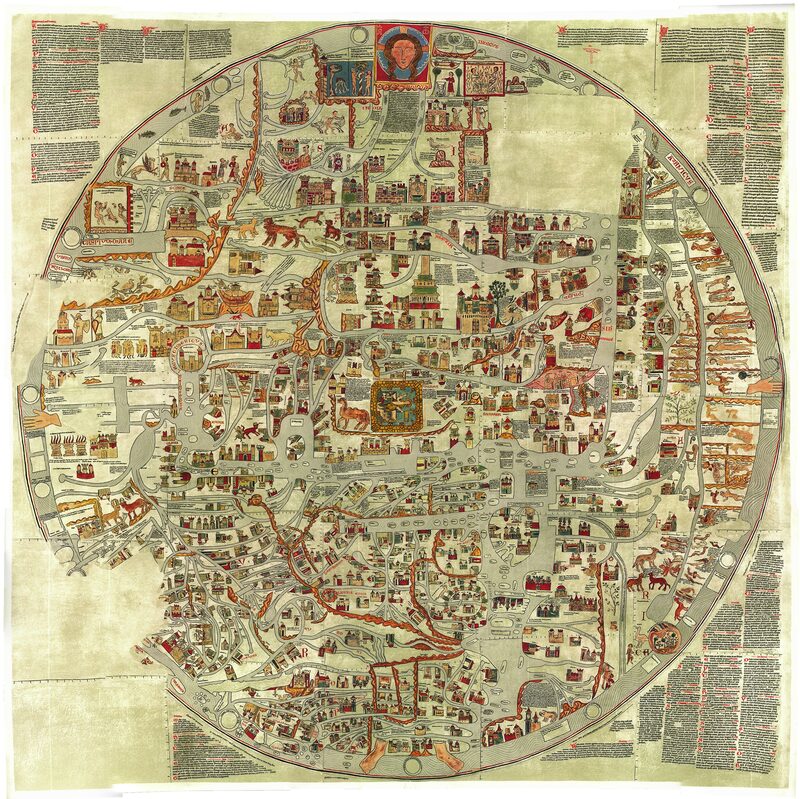 The plan at the bottom comes from the "Geography," a best-seller of fifteenth-century Europe by Pietro del Massaio. 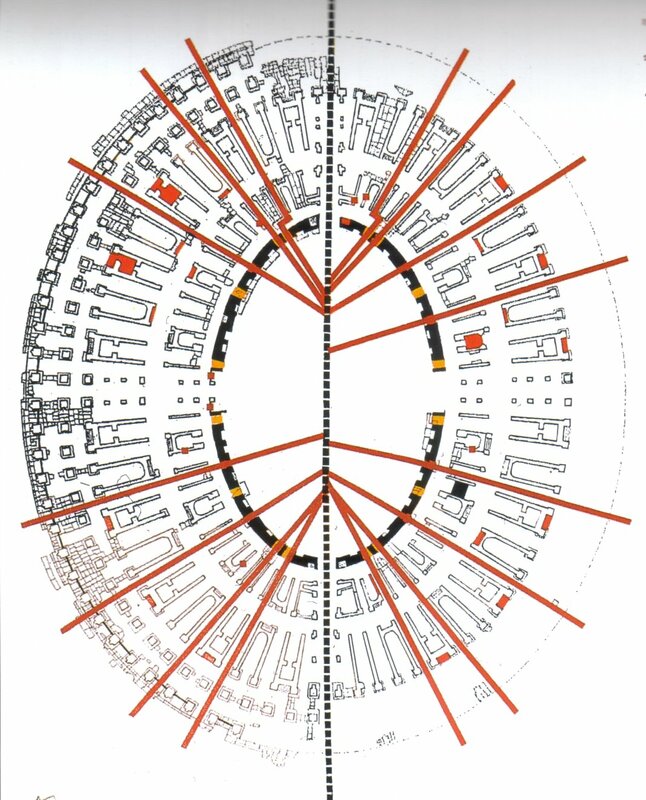 In this plan the circular representation is abandoned in favour of a "scientific" system devised by Leon Battista Alberti (read the story here). 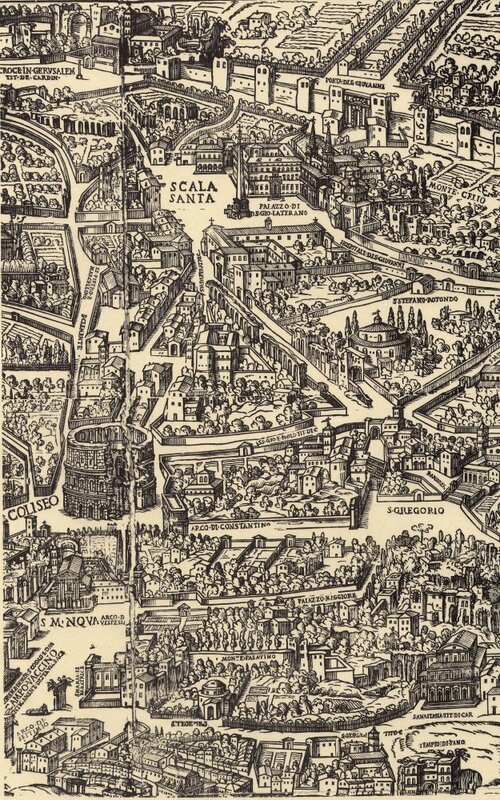 The Castel Sant'Angelo, the Borgo and Saint Peter's appear at bottom right, separated from the city by the Tiber. 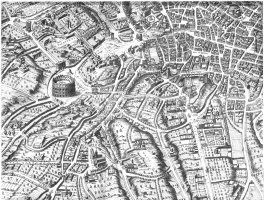 Within the city we see that the Pantheon, the Forum, the Capitoline and Palatine hills and the Colosseum dominate the central space, though a few churches appear beside them. 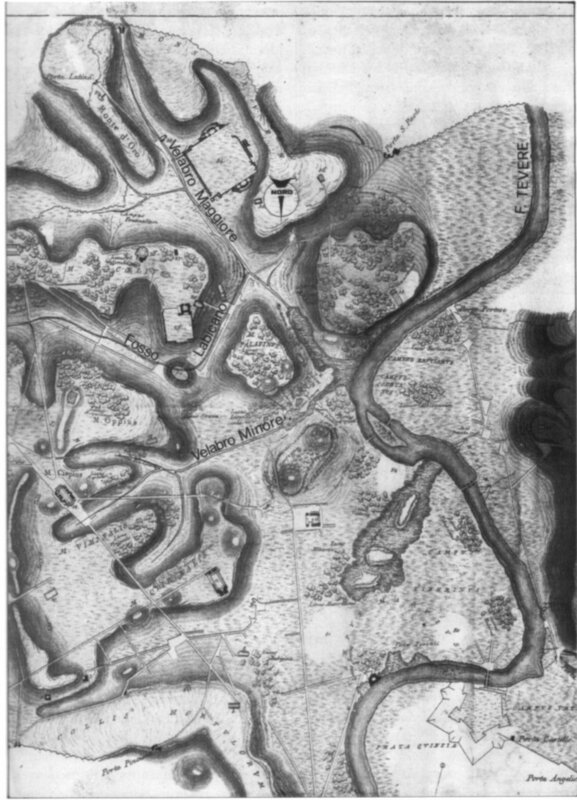 Other monuments, like the Pyramid (top right), can readily be identified. 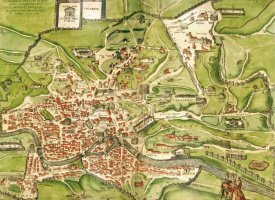 This map by Alessandro Strozzi is rather interesting, because it maintains the circular "medieval" view from the North, but at the same time it is rather complete and precise in the representation of the city and buildings. Apparently this map too was drawn according to Alberti's system. 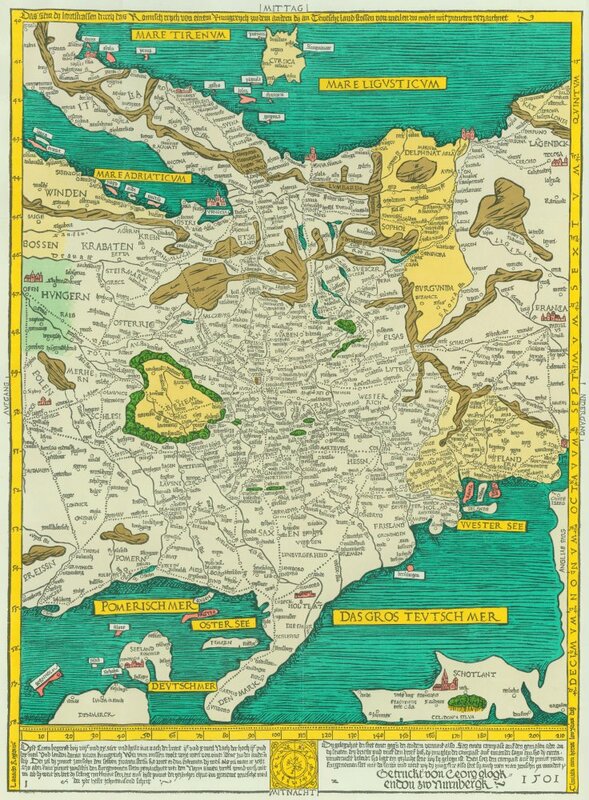 This image comes from the Nuremberg Chronicle, which is an illustrated biblical paraphrase and a world history that includes the histories of a number of important Western cities. Written in Latin by Hartmann Schedel, with a version in German translated by Georg Alt, it appeared in 1493. It is one of the best-documented early printed books � an incunabulum � and one of the first to successfully integrate illustrations and text. The "Coloseus" appears on the left. 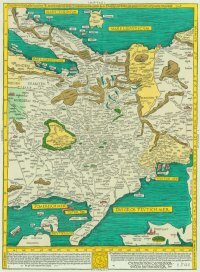 This map by Erhard Etzlaub does not show Rome, but it is extremely interesting because it shows the roads to Rome - from all over Europe - with the distances between the cities. In those times many travelers were pilgrims directed to holy places all over Europe. 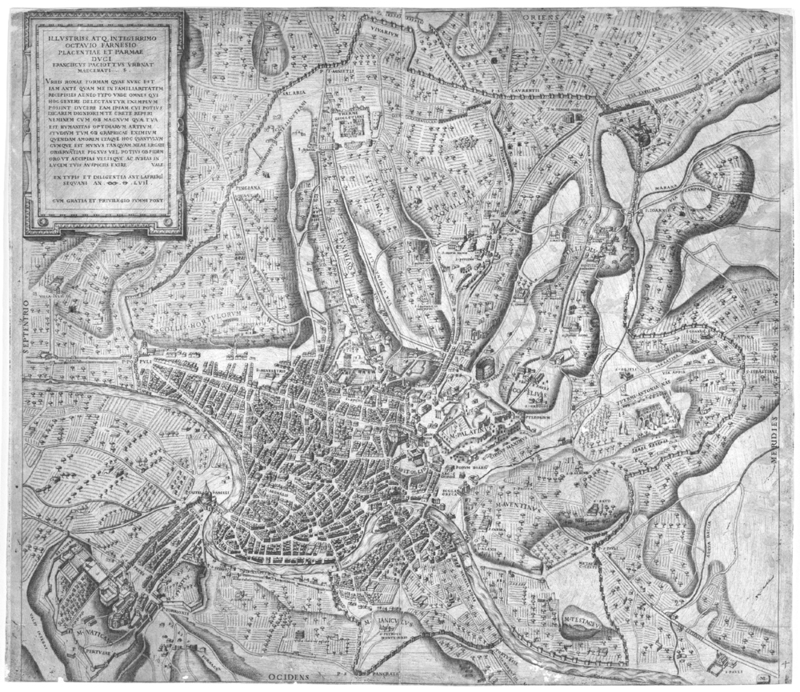 A bigger version of this map can be found here. 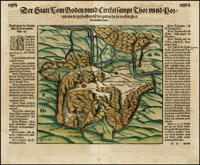 Sebastian Münster was a German cartographer, cosmographer, and a Christian Hebraist scholar. 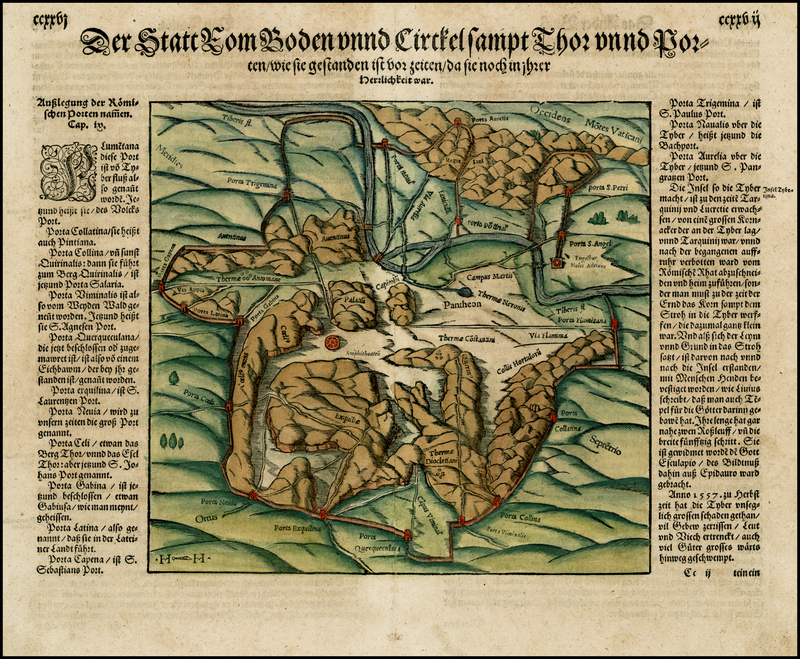 His work, the Cosmographia from 1544, was the earliest German description of the world. His portrait ended on the old 100 Mark banknote. In his picture the amphitheatre is ... missing! If you look carefully, you'll see it mentioned in a footnote under the letter G: " Templum Pacis, ubi quoque stare debuerat Colosseum ingens aedifìcium, sed loci angustia exclusit", that means: "Temple of Peace, where the great building of the Colosseum should also have been, but it was omitted due to lack of space". 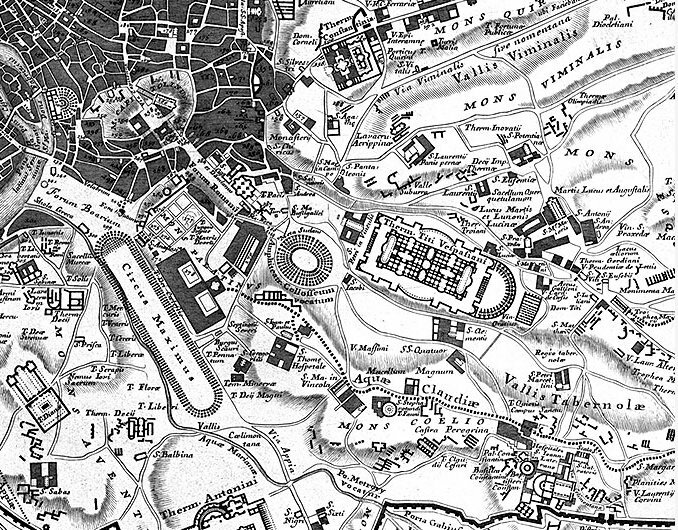 The Bufalini plan-map of the city of Rome (1551) was the first printed map of the Eternal City and a landmark in the history of city plans. 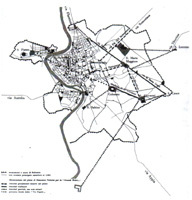 It is the first orthogonal plan of the city since the early third century Forma Urbis. 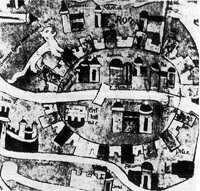 All earlier 14th and 15th century images of the city were view-maps. It is surprising that no plan-map of the city appears until this late in the Renaissance, since the technique was known and used since about 1500. We can see that the Colosseum is still in open countryside. Engraver Nicolas Beatrizet worked with no less than Michelangelo. 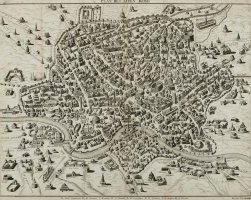 He was one of many artists who came to Rome in the XVI century because there was a good market for prints, engravings and artworks in general. 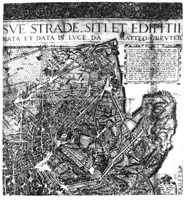 He published his works as part of Antoine Lafrery's Speculum Romanae Magnificentiae (The Mirror of Roman Magnificence). It is likely that individuals who purchased the prints from Lafrery made their own selections and had them bound. 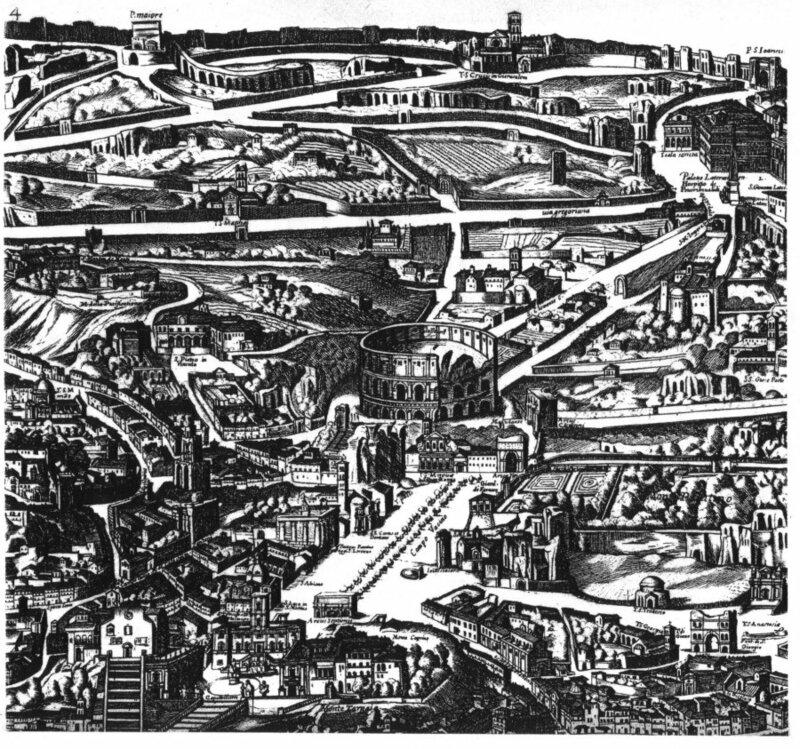 This view is taken from the west; the detail shows very clearly the network of country roads around the Colosseum in 1557. 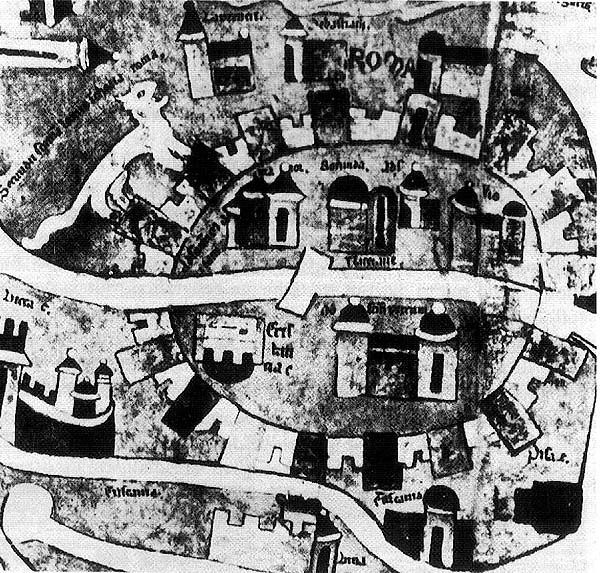 This curious engraving dated 1557, that I found here, shows the city with the fortifications made outside the gates by Pope Paul IV. Pirro Ligorio was an Italian architect, painter, antiquarian and garden designer, also famous for making fake latin inscriptions. 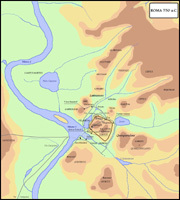 this map is focused on the ancient monuments. 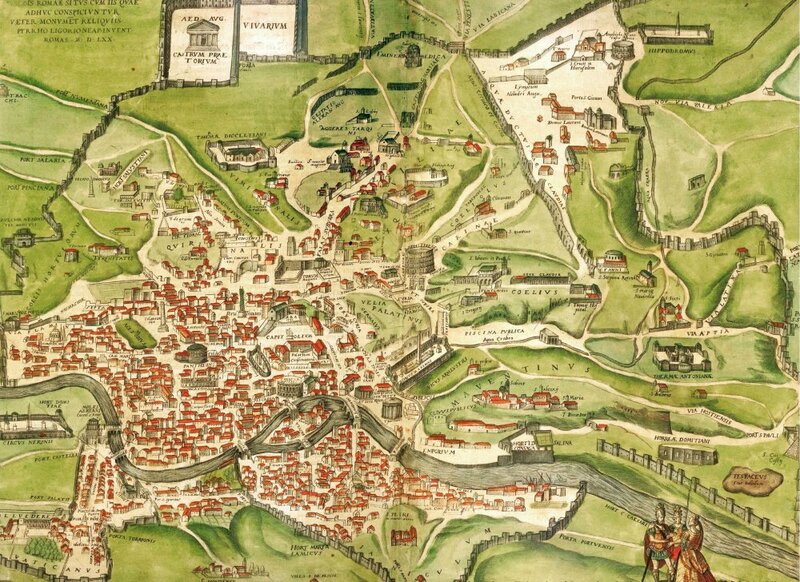 Mario Cartaro published this map in 1576, in a period of great activity by map makers and printers. The houses of the city are still beyond the Forums, and the Colosseum stands among vineyards and orchards. The whole map can be downloaded here. 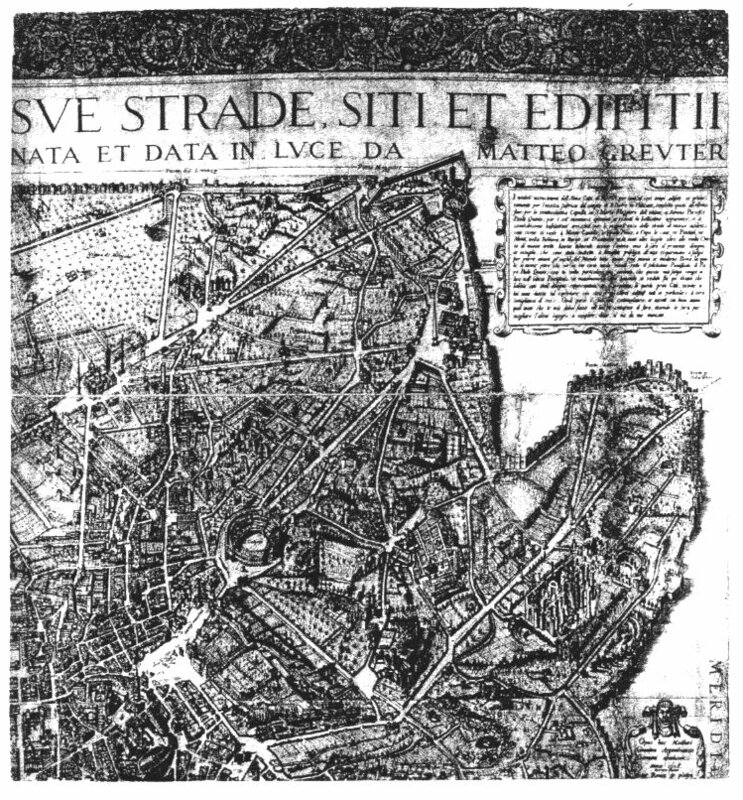 Etienne Du Perac arrived in Rome in 1559 and published a plan of Rome in collaboration with Antoine Lafrery. 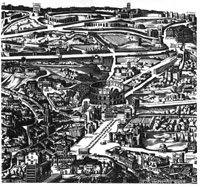 This famous map shows the state of the city before the big changes brought about by Pope Sixtus V. The Colosseum stands in the middle of gardens, orchards, villas and ruins. 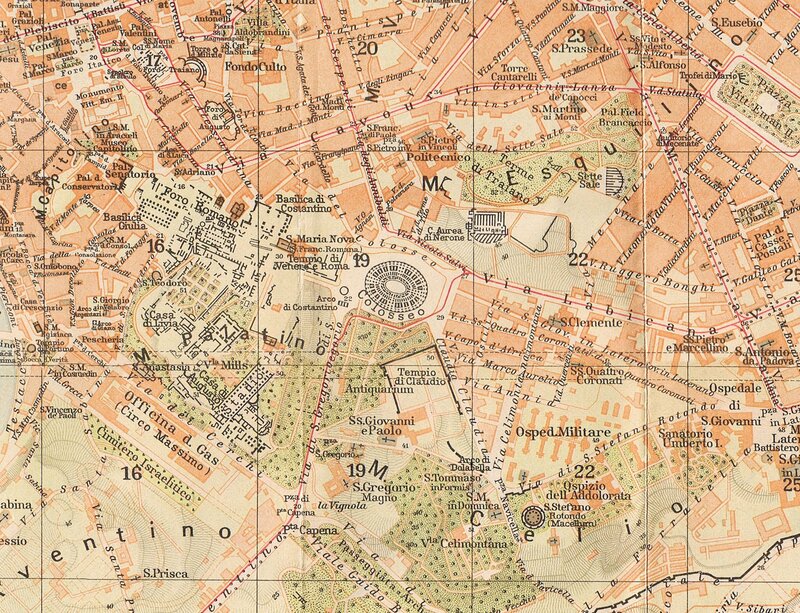 The whole map can be downloaded here. 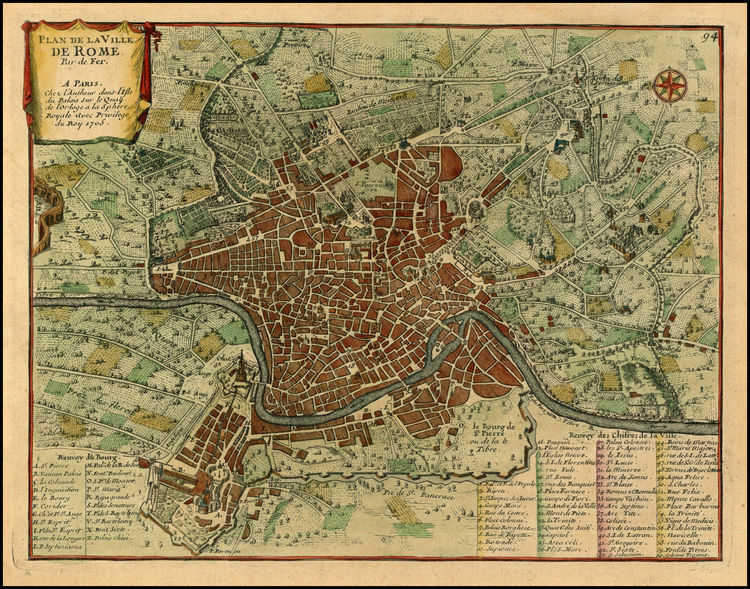 Georg Braun from Cologne edited between 1572 and 1617 the Civitates orbis terrarum, which contains 546 prospects, bird's-eye views and maps of cities from all around the world. His six-volume work was inspired by Sebastian Münster's Cosmographia. Frans Hogenberg (1535–1590, from Munich) created the tables for volumes I through IV. 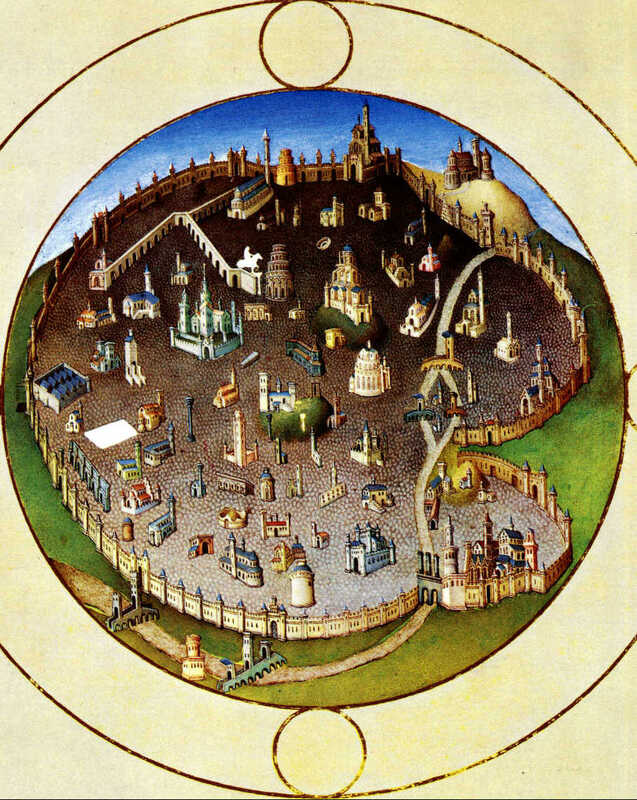 In this image we see that the Colosseum is still surrounded by fields and orchards, outside the city centre. 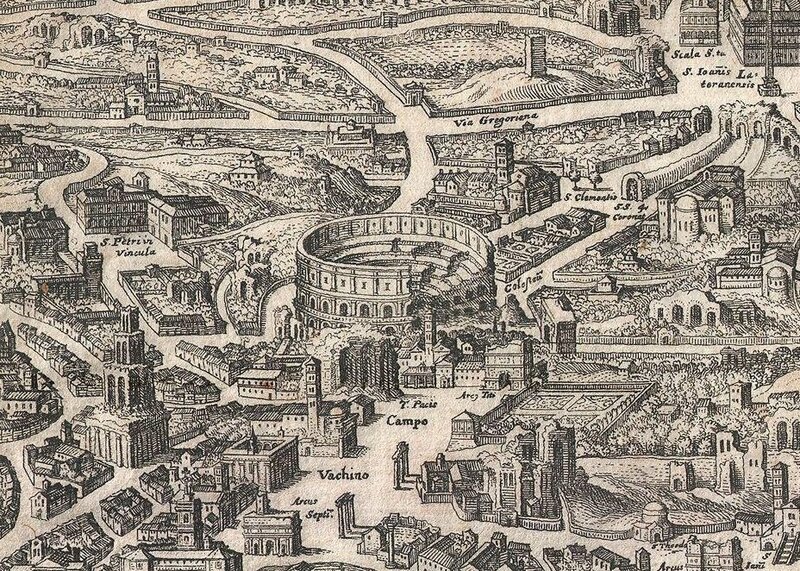 Do not mistake the Colosseum with the Theatre of Marcellus, closer to the river. Sixtus had no appreciation of antiquities, which were employed as raw material to serve his urbanisation and Christianising programs: Trajan's Column and the Column of Marcus Aurelius (at the time misidentified as the Column of Antoninus Pius) were made to serve as pedestals for the statues of SS Peter and Paul; the Minerva of the Capitol was converted into an emblem of Christian Rome; the Septizonium of Septimius Severus was demolished for its building materials. 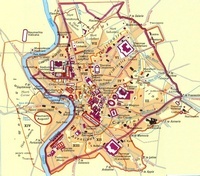 The map shows the streets he opened and that are still the heart of the city: after all Via Sistina is called after him! 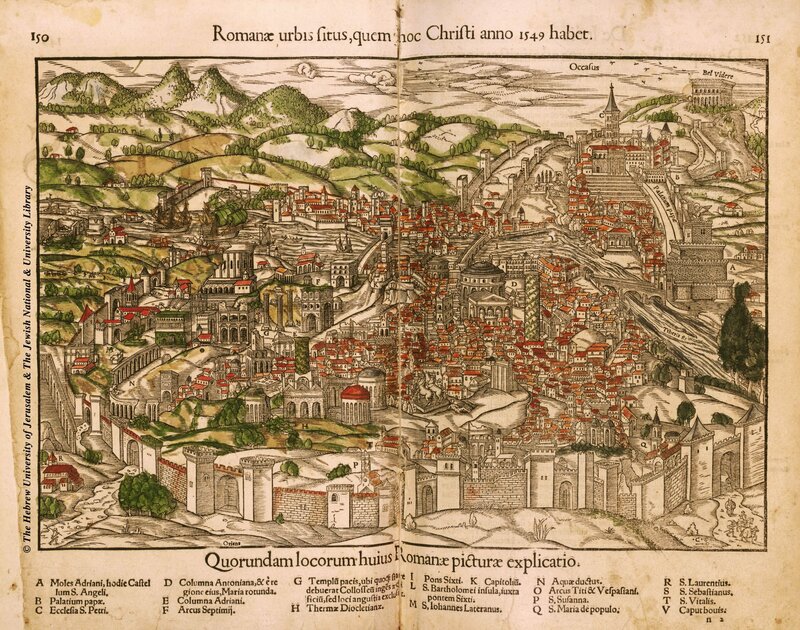 This beautiful aerial view of Rome was first printed in 1593 by painter and engraver Antonio Tempesta, who inaugurated a fashion of eastward oriented views of the city. 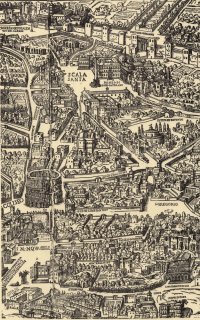 This edition with changes dates to 1645; it shows Rome in its late sixteenth-century condition, with some of the changes brought about by Sixtus. Near the Colosseum there is the new road that leads to St. John's Lateran. See the whole map here or here. In this map by Mathaeus Greuter we can see that the projects of Sixtus have been accomplished: the streets around the Colosseum are beginning to look like they are today: Via di San Giovanni in Laterano, the long straight road between the Colosseum and the Lateran, is opened, and so are other streets planned from St. Mary Major: Via di Santa Croce leads to the church of the Holy Cross and Via Gregoriana (now Via Merulana), that leads to the Lateran, is widened. 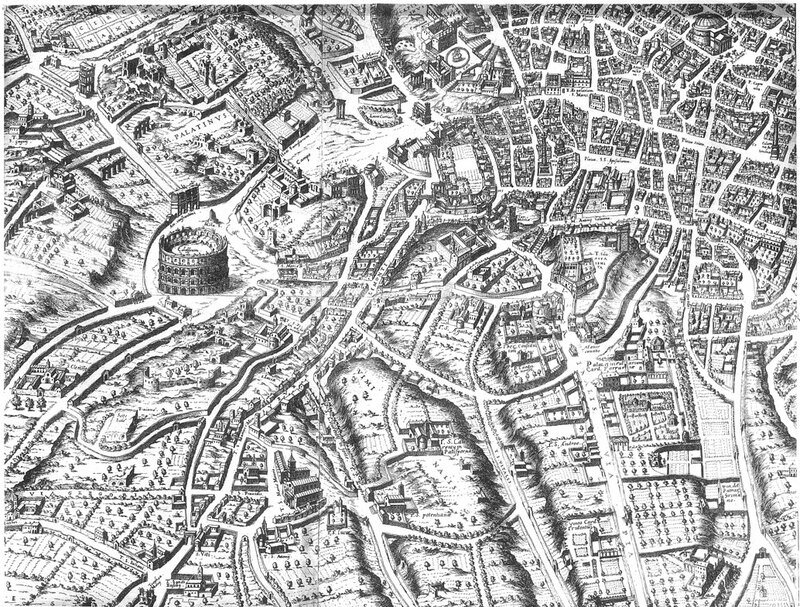 In this view dated 1625 we see many houses along the streets between the Colosseum and the Lateran. 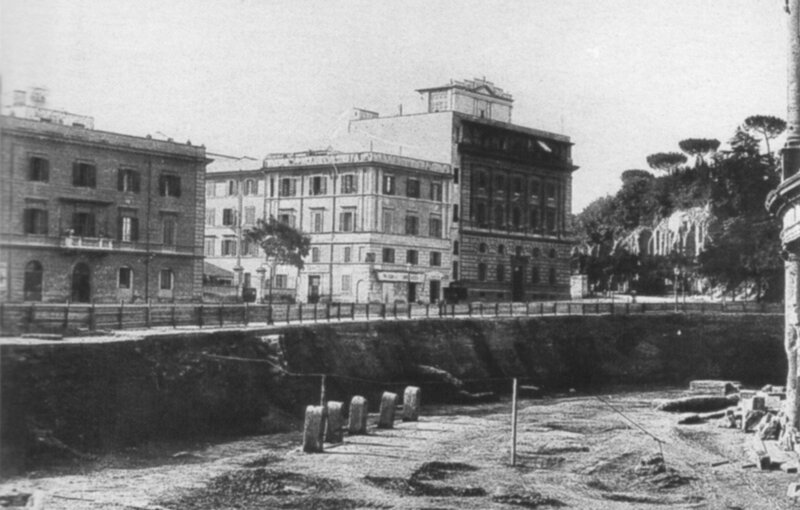 The area is full of churches and convents, but the main buildings on the Lateran square belong to the hospital of Arciconfraternita del Salvatore (still there, still a hospital). 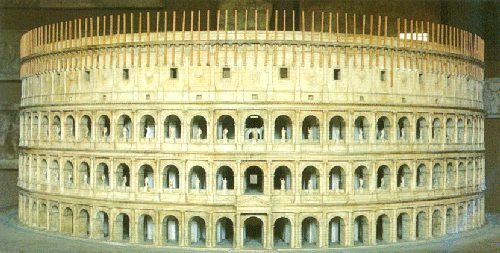 The Arciconfraternita in 1604 had made an agreement with the Senate of Rome, undertaking to provide all the stone (quarried at the Colosseum) necessary to finish the Palazzo dei Conservatori on the Capitol. 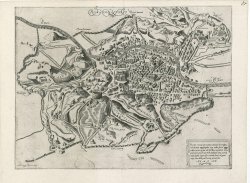 In exchange, it got permission to demolish the Arch of Basile, that was placed at the eastern end of Via dei Santi Quattro (it can be seen on the previous maps) and use its materials to build the hospital. 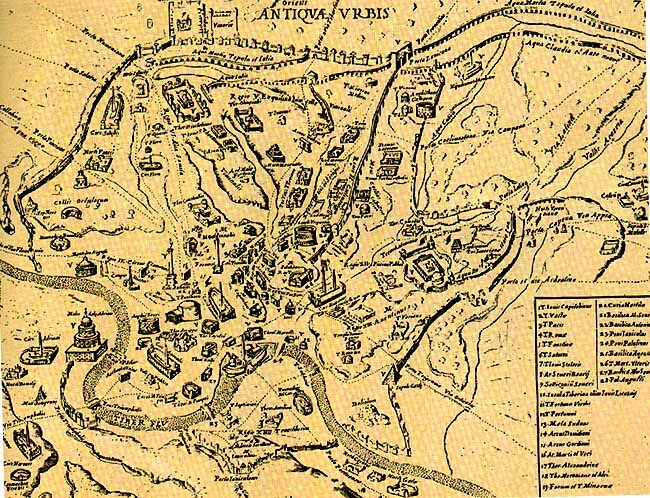 In 1606 the concession to use the stones from the Colosseum was renewed to the Arciconfraternita. Giovanni Maggi was born around 1566 and was active in Rome from the beginning of the XVII century. 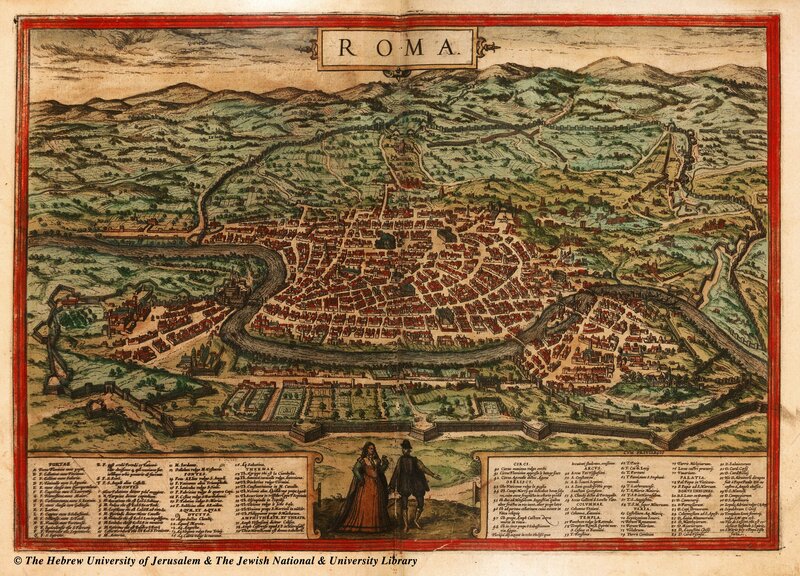 We don't know much of him, but in 1625 he engraved on woodcut the biggest ever (cm 224 x 428) map of Rome. The use of wood is rather unusual, as most artists used to engrave on copper. Probably the explanation is that the wood technique is cheaper and faster. 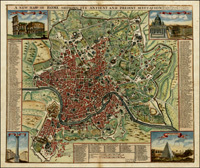 It seems that only few copies were made of the original print, so that soon the memory of this map was lost. 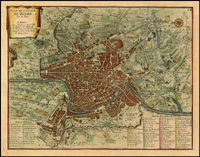 That is probably why in 1774 Carlo Losi reprinted the Maggi map and attempted to sell it as an original publication. The whole map can be downloaded here or here. 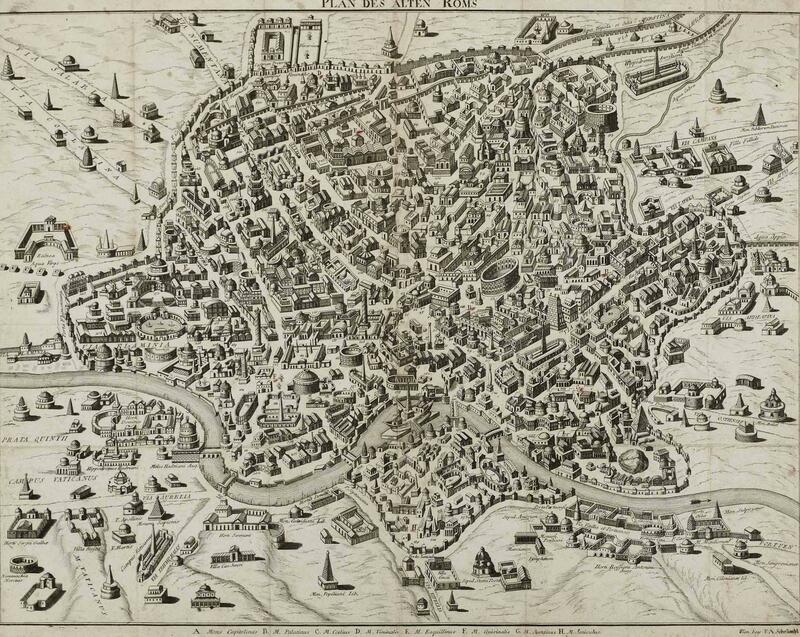 Matthaus Merian (1593 - 1650) was an important Swiss engraver and cartographer. In Frankfurt, he associated with Johann Theodor de Bry and together they produced a number of important joint works. 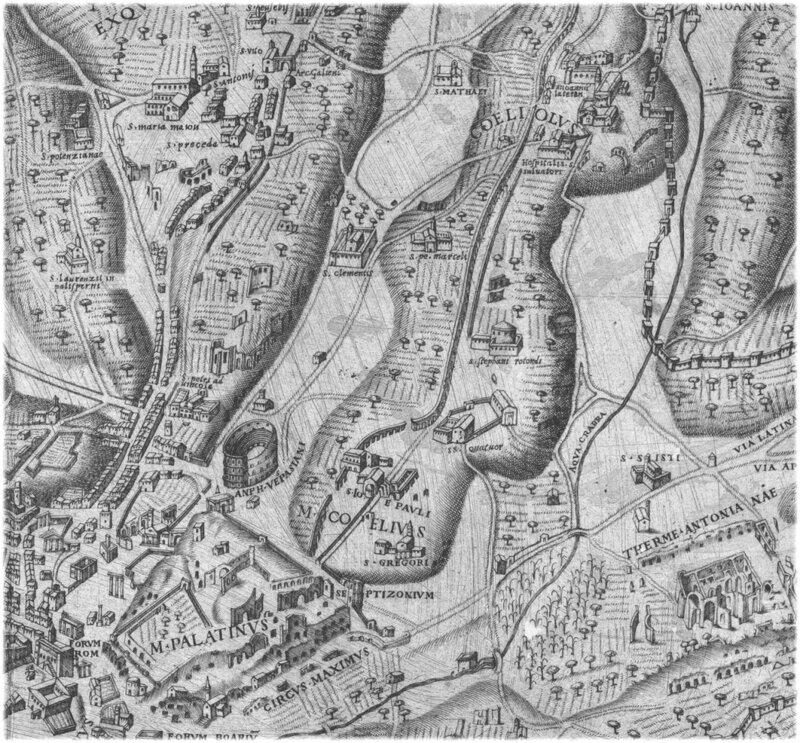 Merian is best known for his finely engraved and highly detailed town plans and city views; he is considered one of the grand masters of the city view and a pioneer of the axonometric projection. After his death in 1650 his two sons, Matthaus and Caspar published his great works, the Topographia Germaniae and Theatrum Europaeum, under the designation Merian Erben. This view follows the eastward oriented model established in 1593 by Antonio Tempesta. 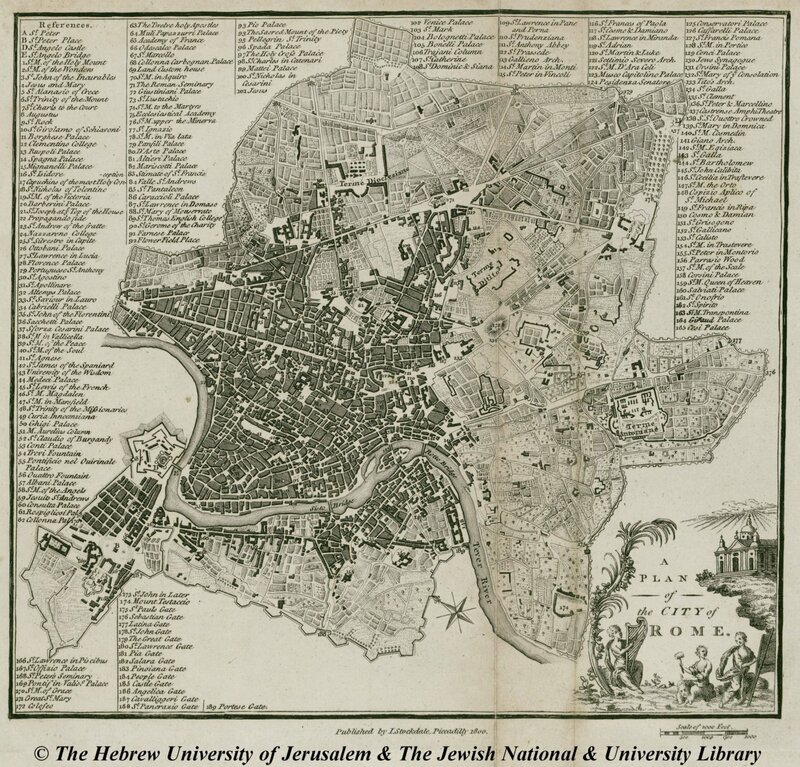 The axonometric projection that Merian utilizes lends this map a special significance to historians and architects who can thus visualize many buildings that were demolished or fell into ruin during the subsequent era. 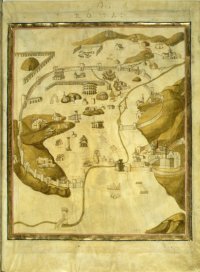 This map also includes some of the only surviving visual representations of Rome's early churches, many of which were replaced with grander structures in the 18th century. 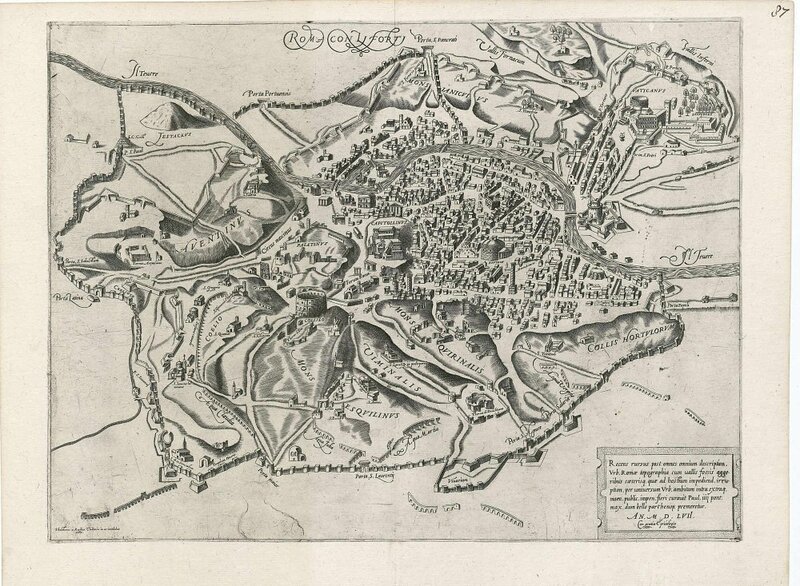 French cartographer Nicolas de Fer (1646 – 1720) was also geographer, engraver and publisher. 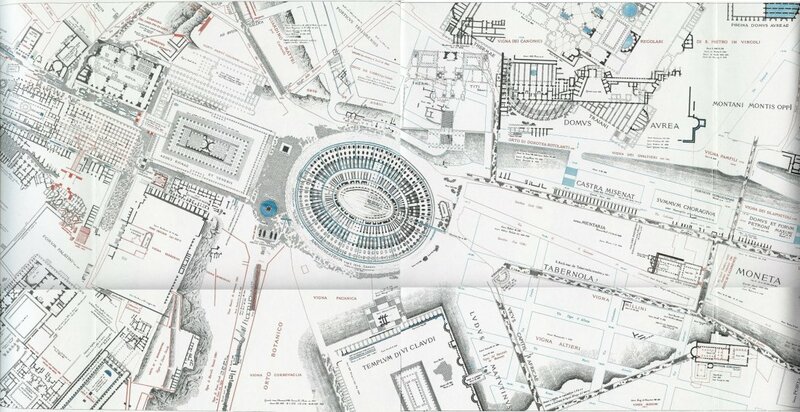 In this map we see that the area of the Colosseum is becoming part of the city. 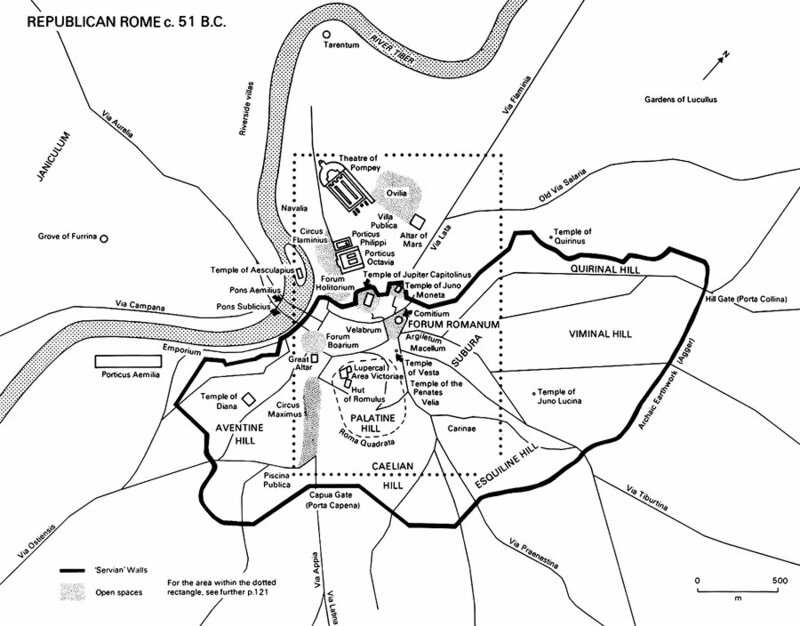 The houses have now reached the valley of the Colosseum and link the amphitheatre to the Lateran. This map of the city looks a bit like modern maps for tourists. 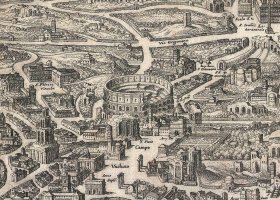 The main attractions, St. Peter's, the Colosseum, the Trajan Column and the Pyramid, are highlighted at the corners, and many important places are numbered and explained in the columns. 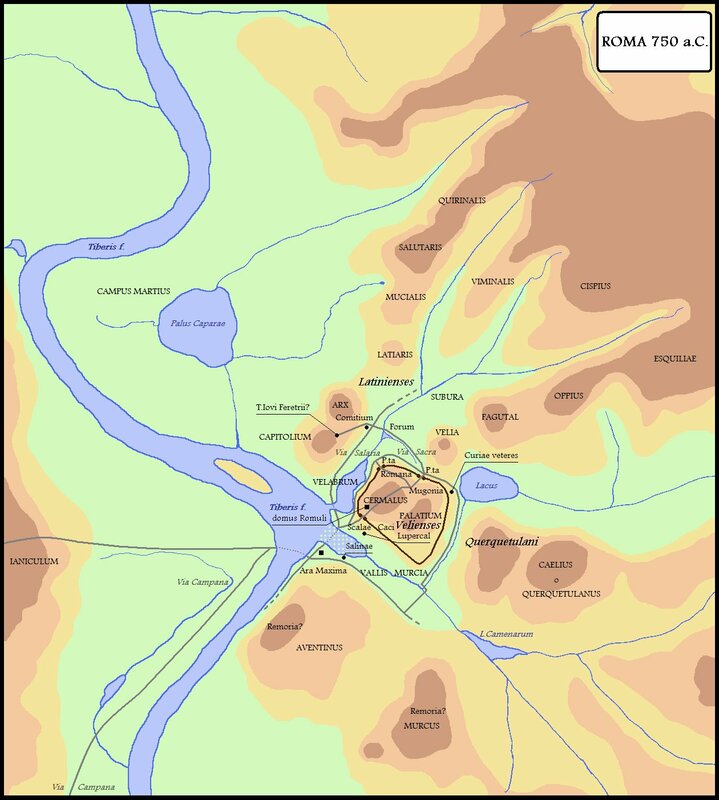 The map doesn't really want to be realistic, as it shows the ancient and present "scituation" of the city. It is very pleasant to look at, though. The other picture, by Canaletto, shows the state of the monument around 1720. 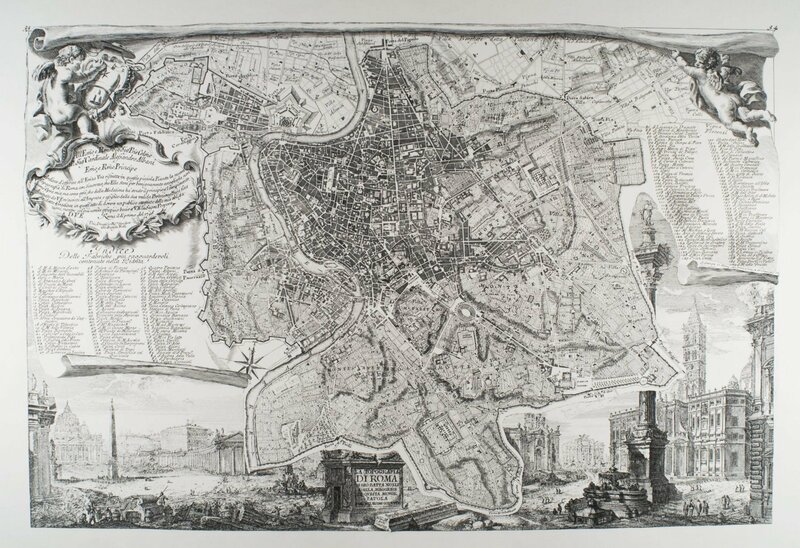 Giambattista Nolli was an architect and surveyor who devoted his life to documenting the architectural and urban foundations of the city. 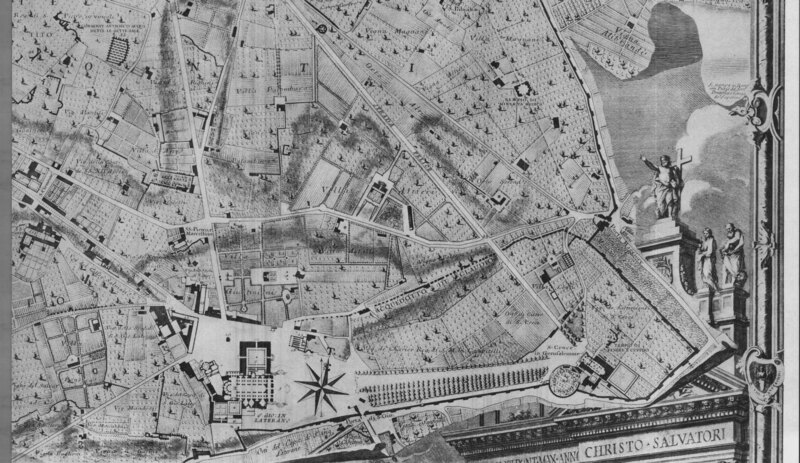 He is best known for his Pianta Grande di Roma which he began surveying in 1736 and engraved in 1748. 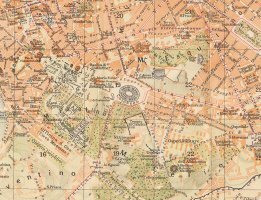 Nolli achieved an extraordinary technical feat that represents a milestone in the art and science of cartography. Modern surveys and sophisticated satellite images have confirmed the accuracy of Nolli's map within the smallest margin of error. 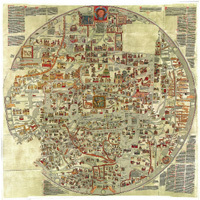 The map is composed of 12 copper plate engravings that together measure 176 centimetres (69 in) by 208 centimetres (82 in). It was by far the most accurate description of Rome produced to date. 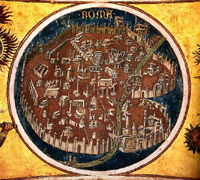 The Nolli map reflects Bufalini's map of 1551, however Nolli reorients the city from east to magnetic north, reflecting his reliance on the compass for surveying, and represents enclosed public spaces, such as the colonnades in St. Peter's Square and the Pantheon, as open civic spaces. 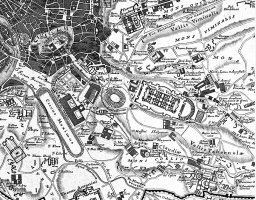 The map was a significant improvement in accuracy and it was used as a base map for all Roman mapping and planning up to the 1970s. 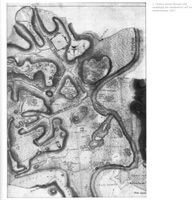 This great website of the University of Oregon is dedicated to the Nolli map. Explore and learn! 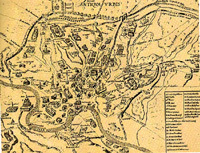 The map can also be downloaded at the UC Berkeley website. 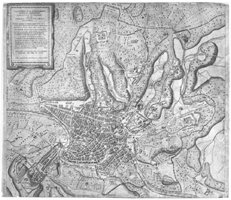 Nolli collaborated with famous engraver Piranesi in producing a smaller version of this map, the Piccola Pianta, begun in 1747, but published with the larger map in 1748. It can be explored here. 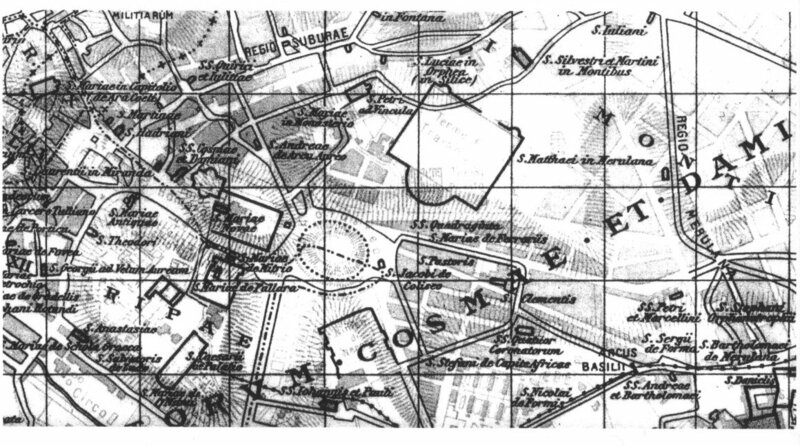 The map drawn by T. Ettling and published by Day & Son shows a row of houses between the Colosseum and the Lateran, but the area is still rather empty. Practically the same map appears published by John Dower in 1852. Many repairs are made to the old amphitheatre; see here for the details. The area around the monument is finally cleaned and reordered, the monumental portico on the northern side (the one that appears on the coins) is again brought to light and the boundary stones towards via Labicana are unearthed. 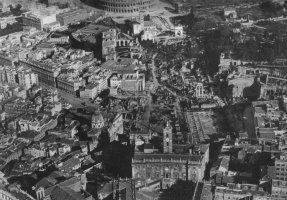 The fascist regime wanted to bring back the memories of imperial Rome to support the concept of the newborn Italian Empire, so Mussolini ordered the opening of Via dell'Impero to link Piazza Venezia with the Colosseum (that was used for fascist rallies) and have military parades in that spectacular place. The works lasted from 1924 to 1932. 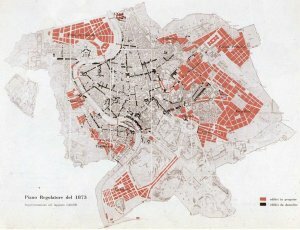 Rightly, Wikipedia writes: "Although the road was touted as a celebration of the glories of ancient Rome, its construction entailed the systematic demolition of over 40,000 square yards of one of the most densely populated areas of Rome, obliterating ancient, medieval and Renaissance structures, including five churches and popular tenements that housed 746 of Rome's poorest families. .... 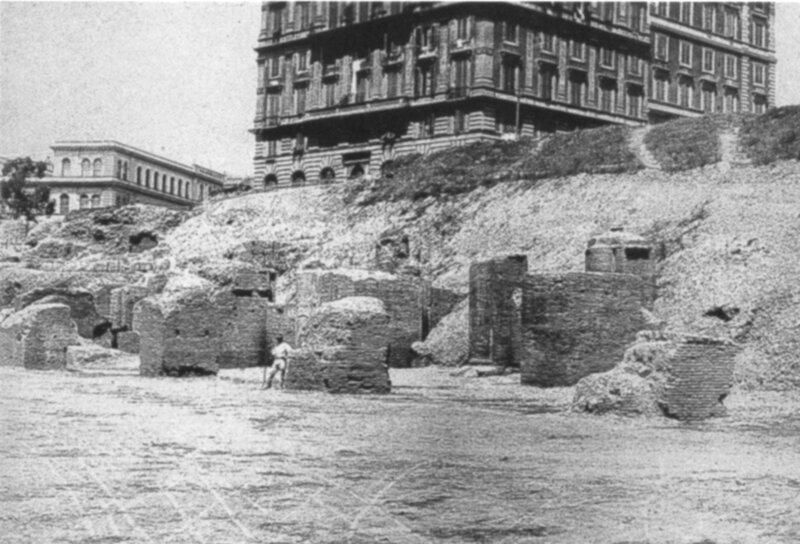 The Via del Fori Imperiali completely changed the landscape and character of the heart of Rome and sliced the Fora area in two. General outrage is often the reaction of modern archaeologists and scholars when discussing it. 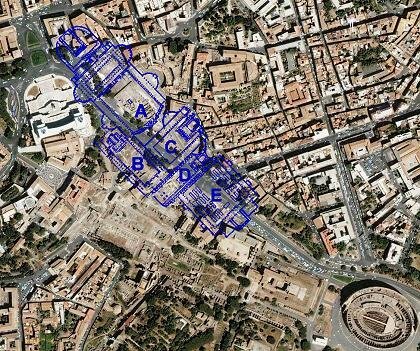 Perhaps the biggest issue of all is that the now four-lane, heavily trafficked road carries an extremely heavy load of motor vehicle traffic straight through the Roman Forum area, whose exhaust fumes and vibrations continue to do immeasurable damage to the surrounding ancient Roman monuments. 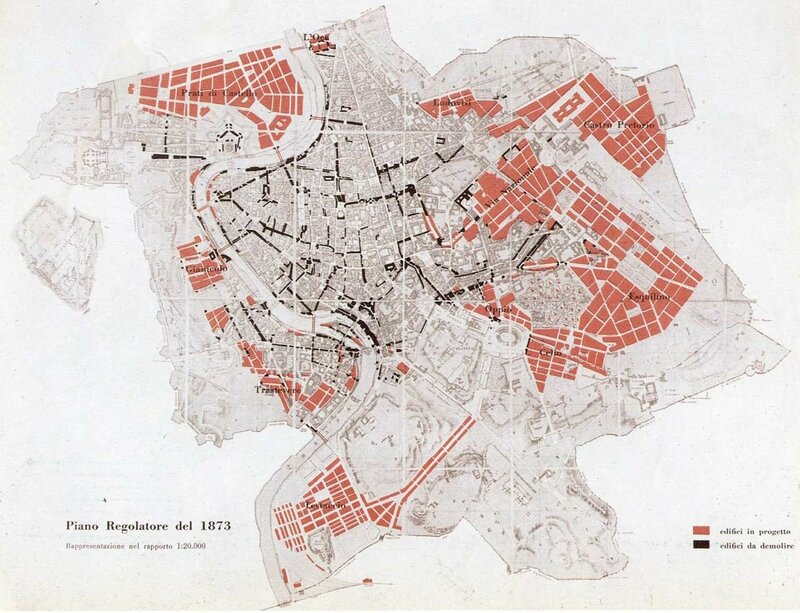 However, numerous efforts by academics and citizen’s groups have thus far failed to convince the Roman city government to attempt to undo what Mussolini government created by removing the road, other than the creation of a pedestrian zone on Sundays and national holidays." Read here for more details. The maps below show the changes. 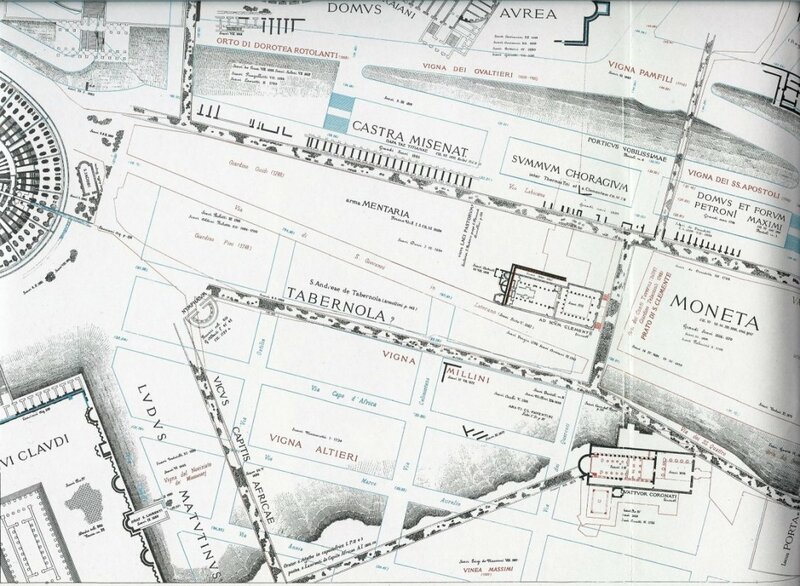 What lies under Via dei Fori Imperiali?